(PRLEAP.COM) November 6, 2015 - The September launch of HAKT Radio, the world's first near-demand music site, offers real-time content to music lovers with no advertisements and unlimited skips-all for free. HAKT Radio aims to offer music lovers more choices than ever before, providing a fully customizable experience. You can access HAKT Radio immediately at http://www.HAKTRadio.com. HAKT Radio builds upon the successes of Pandora and similar services by offering an experience that customizes music offerings based on previous artist and genre choices. But unlike these older services, HAKT Radio allows users to skip as many songs as they wish. While other providers have excluded certain artists or prevented users from selecting specific titles, HAKT Radio offers a user-driven experience that puts the consumer back in control. With an ambitious goal of becoming the Google of radio stations, HAKT Radio aggregates more than 100,000 radio stations, allowing users to access their favorite music and favorite stations no matter where they are. Summering abroad in India or doing charitable work in Botswana? HAKT Radio allows you to tap into the comforts and music of home with a click of your mouse. For those contemplating a move, HAKT Radio enables you to check out the local music scene before you pack your bags. HAKT Radio seamlessly blends the versatility of satellite radio with the custom experience of Internet radio. "HAKT Radio offers the best all-around user experience, marrying the experience of a traditional radio service to the customizability of app-based music choices," Blair Tasslow explained. "Listeners can select any song at any time, quickly search for their faves playing anywhere in the world, and never be forced to listen to ads and other content they don't like. Skipping content is like turning the radio dial. But instead of choosing from a dozen or so stations, users can survey the world of radio choices." How Does HAKT Radio Work? HAKT Radio's powerful search engine allows users to seek specific songs or artists. In less than a second, users can access tens of thousands of radio stations to find the music they want. When they do, they can tune into the broadcast by simply clicking on the title. HAKT Radio's massive library of stations, coupled with its smart algorithms, connects users to most popular songs within HAKT Radio. HAKT Radio continually catalogs and indexes offerings of thousands of Internet radio and online AM/FM stations across the globe. It then collects that information into a powerful search engine, allowing users to seamlessly search for their favorite songs. Users can select a genre to play the most popular songs in that category, based upon what local DJs are playing. 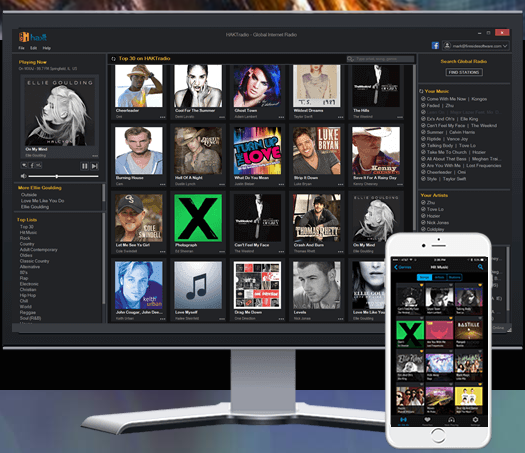 This allows users not only to find what they want, but to be introduced to new music they might love.